An idea for a bill may come from anybody, however only Members of Congress can introduce a bill in Congress. Bills can be introduced at any time. 2 An idea for a bill may come from anybody, however only Members of Congress can introduce a bill in Congress. Bills can be introduced at any time the House is in session. There are four basic types of legislation: bills; joint resolutions; concurrent resolutions; and simple resolutions. A bill's type must be determined. A private bill affects a specific person or organization rather than the population at large. A public bill is one that affects the general public. 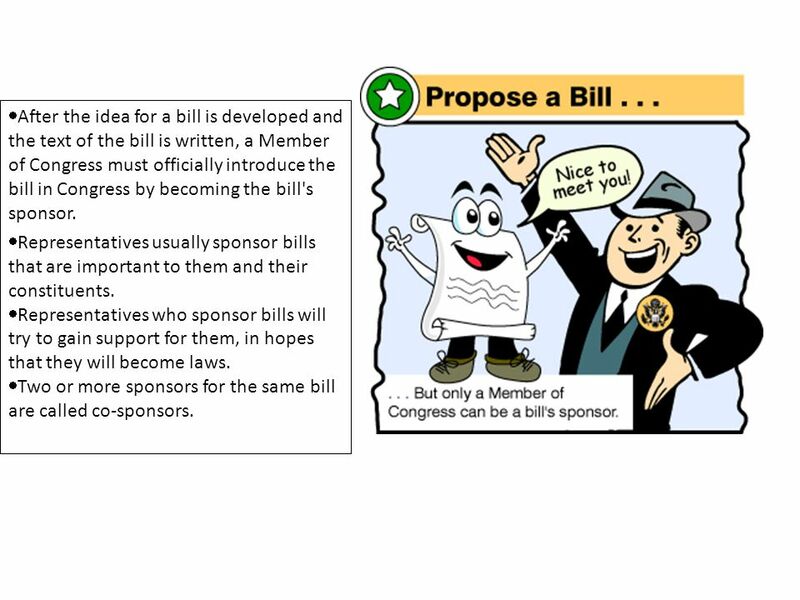 3 After the idea for a bill is developed and the text of the bill is written, a Member of Congress must officially introduce the bill in Congress by becoming the bill's sponsor. Representatives usually sponsor bills that are important to them and their constituents. Representatives who sponsor bills will try to gain support for them, in hopes that they will become laws. Two or more sponsors for the same bill are called co-sponsors. 4 Bills can be introduced whenever the House is in session. 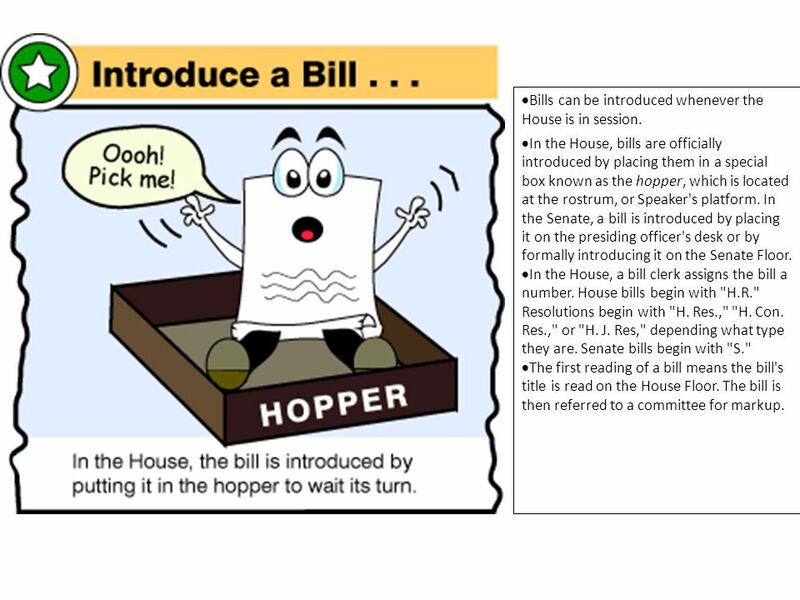 In the House, bills are officially introduced by placing them in a special box known as the hopper, which is located at the rostrum, or Speaker's platform. In the Senate, a bill is introduced by placing it on the presiding officer's desk or by formally introducing it on the Senate Floor. In the House, a bill clerk assigns the bill a number. House bills begin with "H.R." Resolutions begin with "H. Res.," "H. Con. Res.," or "H. J. Res," depending what type they are. Senate bills begin with "S." The first reading of a bill means the bill's title is read on the House Floor. The bill is then referred to a committee for markup. The bill is referred to the appropriate committee. The 19 House standing committees and 16 Senate committees each have jurisdiction over different areas of public policy, such as agriculture, education and the workforce, and international relations. The bill is placed on the committee's calendar. The committee debates on and marks up the proposed bill, and may or may not make changes to it. Committee members vote to accept or reject the changes made during the markup session. If a bill includes many amendments, the committee may decide to introduce a "clean bill" with a new number. The committee votes on the bill after it has been debated and/or amended. 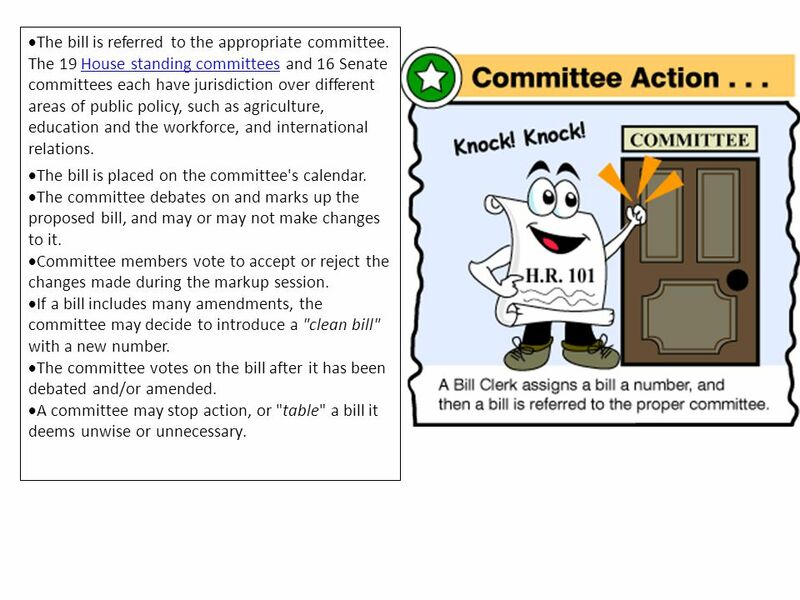 A committee may stop action, or "table" a bill it deems unwise or unnecessary. 7 The bill is released from the committee, along with a report explaining the provisions of the bill, and is thus ordered reported. 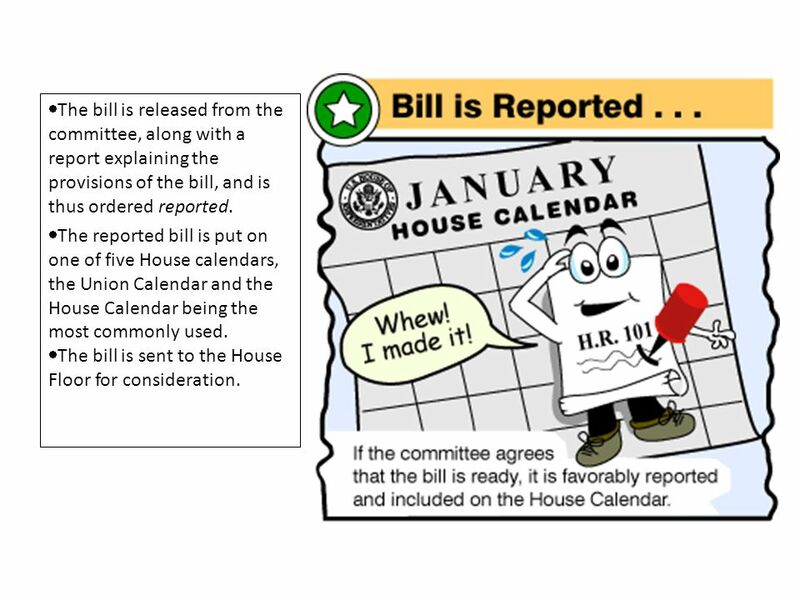 The reported bill is put on one of five House calendars, the Union Calendar and the House Calendar being the most commonly used. The bill is sent to the House Floor for consideration. 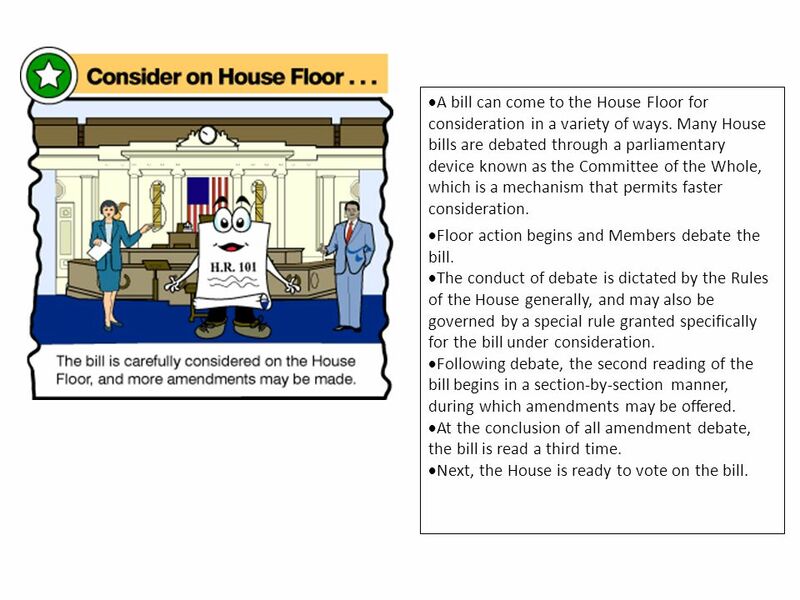 8 A bill can come to the House Floor for consideration in a variety of ways. 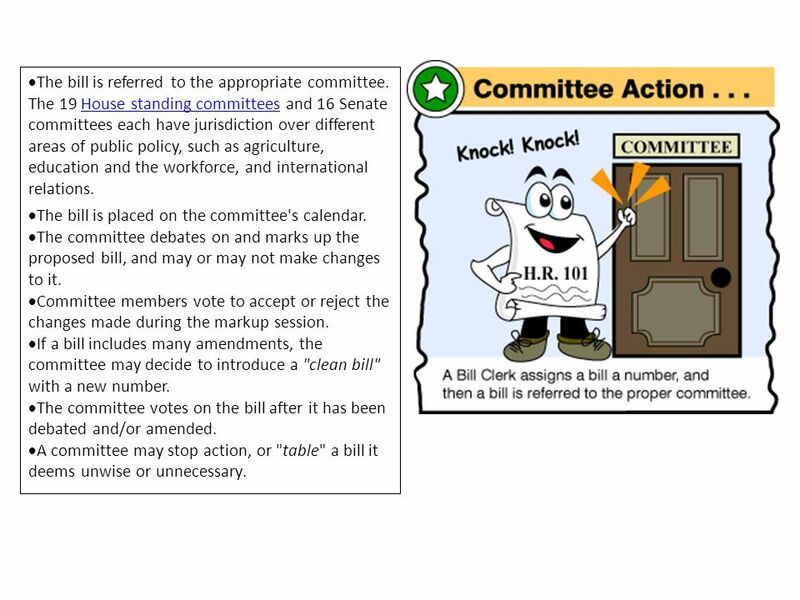 Many House bills are debated through a parliamentary device known as the Committee of the Whole, which is a mechanism that permits faster consideration. Floor action begins and Members debate the bill. The conduct of debate is dictated by the Rules of the House generally, and may also be governed by a special rule granted specifically for the bill under consideration. Following debate, the second reading of the bill begins in a section-by-section manner, during which amendments may be offered. At the conclusion of all amendment debate, the bill is read a third time. Next, the House is ready to vote on the bill. 9 The bill is read by title only and put to a vote. Members in attendance will vote to pass or not to pass the bill. Members most often vote electronically in the House Chamber using the Electronic Voting System. Members of the Senate cast their votes by non-electronic means. Roll Call votes cast by the U.S. House of Representatives are recorded in the House Journal, the Congressional Record, and posted on the website of the Clerk of the House. Members may vote "Yea" for approval, "Nay" for disapproval, or "Present" to record that they were in attendance but chose not to vote. If a majority of the House votes to pass the bill, the bill is then referred to the Senate to undergo a similar process of approval. 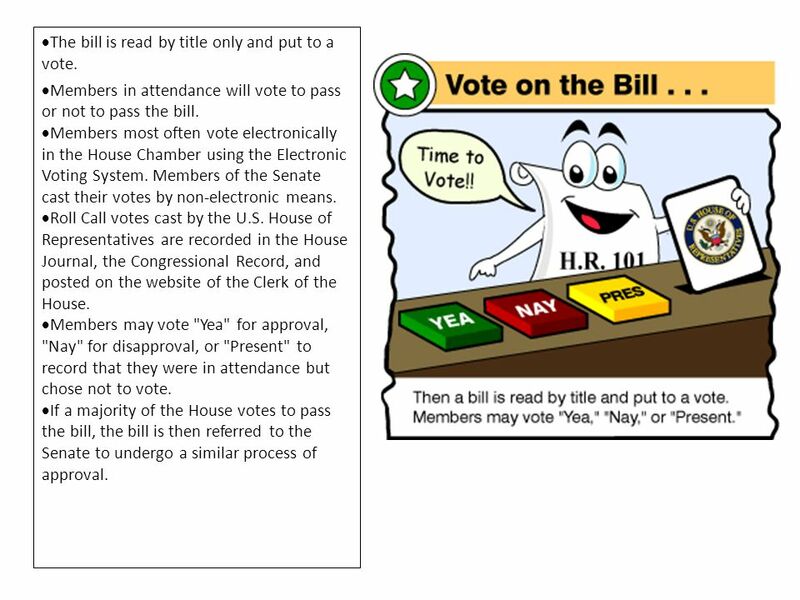 10 When a bill passes in the House, it must also pass in the Senate in order to become a law. The two houses of Congress make up the bicameral legislature, part of a system of checks and balances that ensures that laws are created democratically. Once the bill and its amendments has been officially passed by the House and certified by the Clerk, it is said to be "engrossed." In the Senate, the bill again may be sent to a committee for study or markup. Members may choose to ignore the bill and continue to work on their own legislation. Members may vote to pass or not to pass the bill. If the bill passes with different language, it must be sent for review to a conference committee, which is a committee made up of members from both the House and the Senate. Differences must be agreed upon before the bill is sent to the President for signature. At this point the bill is "enrolled." 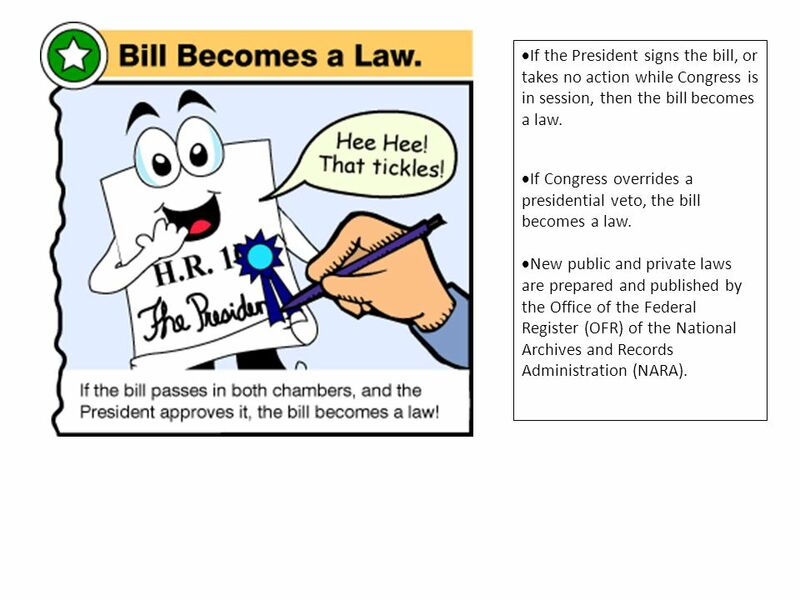 11 If the President signs the bill, or takes no action while Congress is in session, then the bill becomes a law. 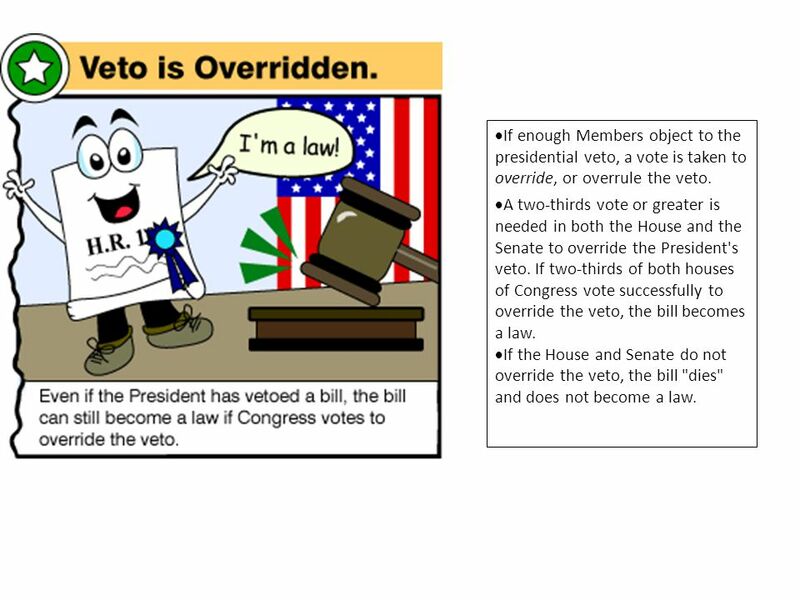 If Congress overrides a presidential veto, the bill becomes a law. New public and private laws are prepared and published by the Office of the Federal Register (OFR) of the National Archives and Records Administration (NARA). 12 If the President decides a bill is unwise or unnecessary, the President does not sign the bill, but issues an official statement of objections to the bill called a veto. The President can veto a bill indirectly by withholding approval of the bill until Congress has adjourned sine die. This informal way of preventing a bill from becoming a law is called a pocket veto. When the President issues a veto, the bill returns to its House of origin. Objections to the veto are read and debated on the House Floor. If there are enough objections in the House to the presidential veto, a vote is taken to override, or overrule, the veto. If the House does not vote on a veto override, the bill is stalled and does not become a law. 13 If enough Members object to the presidential veto, a vote is taken to override, or overrule the veto. A two-thirds vote or greater is needed in both the House and the Senate to override the President's veto. If two-thirds of both houses of Congress vote successfully to override the veto, the bill becomes a law. 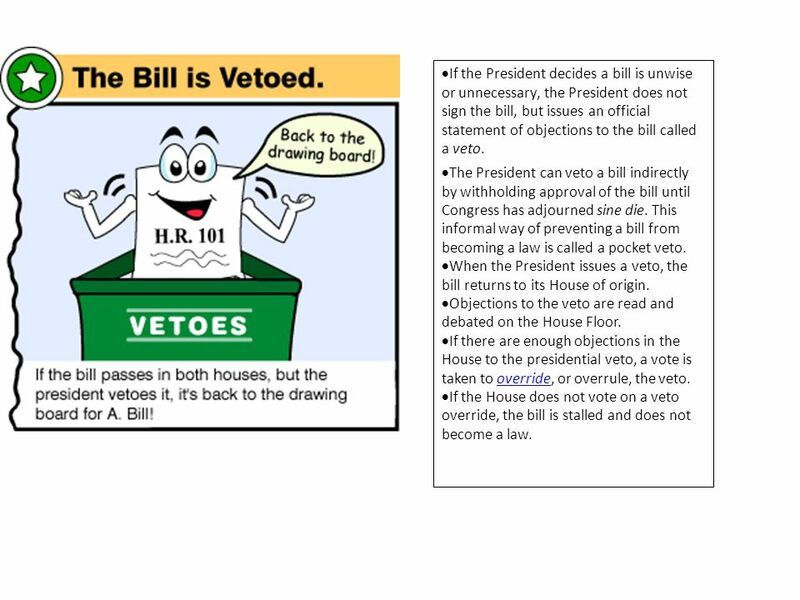 If the House and Senate do not override the veto, the bill "dies" and does not become a law. 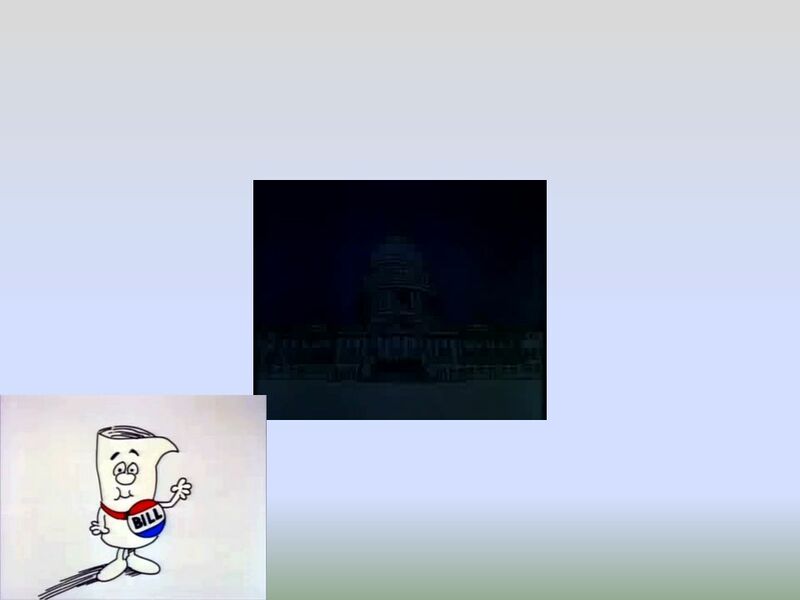 Download ppt "An idea for a bill may come from anybody, however only Members of Congress can introduce a bill in Congress. Bills can be introduced at any time." 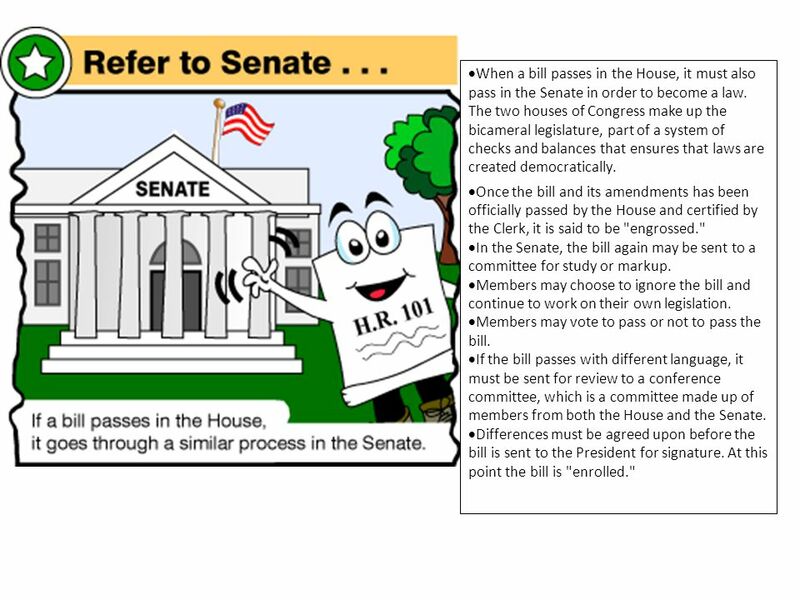 How a Bill Becomes a Law Ch. 6 Sec. 4.
Who can propose a law? Anyone can suggest an idea for a law. Warm Up: What law would you like to see passed? (must be Constitutional) What law would you like to see passed? (must be Constitutional) How could you. Hello Donnia Trent, Moderator/Instructor IRSC Main Campus, Tomeu Center, GED, Lab 311 Fort Pierce, FL. Congress at Work. 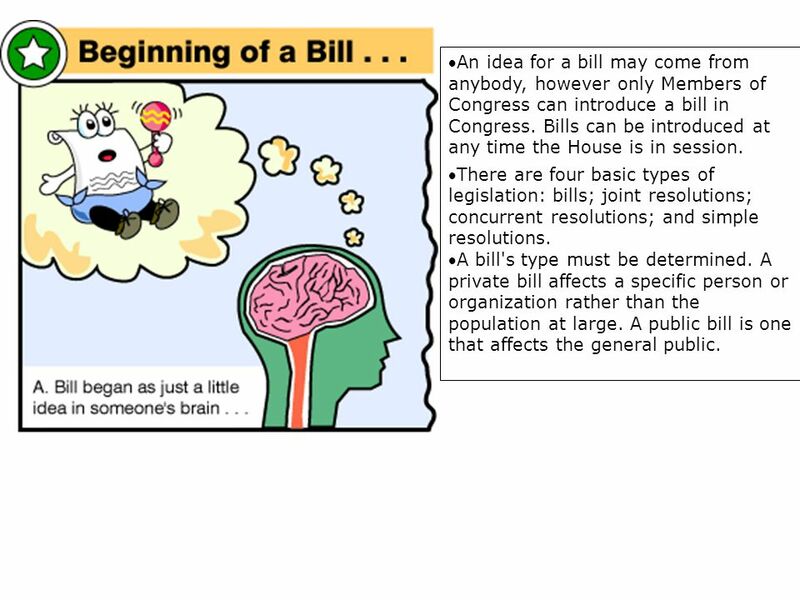  1,000 of bills go to Congress every session, only about 100 are made into laws...why do you think that is?  How are bills killed? The Legislative Process in the United States Prepared by NORPAC 2/2/2015. Legislative Process How A Bill Becomes A Law.  Congress in Action How in the world does Congress operate? How a Bill Becomes a Law. Thousands of bills are introduced each session ◦6,562 were introduced in the 111 th Congress ◦Bills can only be introduced by. Congress Convenes Congress convenes every two years—on January 3 of every odd-numbered year. The House has formal organizational meetings at the beginning. How a Bill Becomes a Law. Bills Travel at Different Speeds Bills to spend money, tax, or regulate businesses move slowly Bills with a clear, appealing. 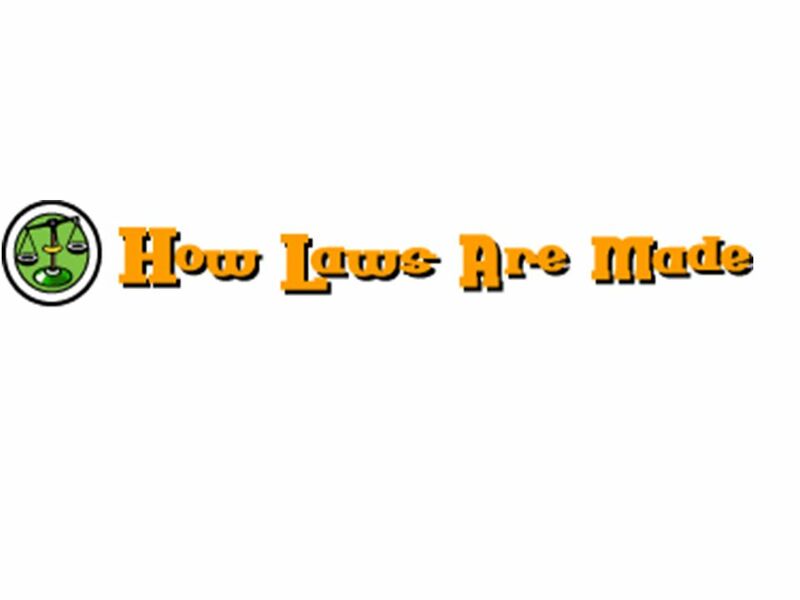 Essential Question  Why do you think only 10% of all bills proposed actually become a law? How a Bill Becomes a Law The Journey of a Bill. Congress Makes Federal Laws Follow the bill as it moves through Congress.